A team of law student volunteers is supporting patients at the Shade Tree Clinic, where students of Vanderbilt Medical School provide free care to uninsured patients, with legal needs assessment and referral services. The issues law students uncover in interviews with clinic patients can be particularly important, according to Emily Sachs ’20, who leads the law volunteer team, in circumstances where an issue with a legal remedy may be causing or exacerbating a patient’s medical issues. Teams of law and medical students have worked in tandem to support the low-income people seeking free medical care at the clinic periodically since 2011, when Karen Usselman Lindell ’12 helped establish the Medical Legal Partnership with her husband, Brad Lindell (MD’12), then a fourth-year student at Vanderbilt Medical School. In 2018, Assistant Dean for Public Interest Law Spring Miller and Sachs recruited Kent Halkett ’81, a retired trial lawyer, to accompany law students when they interview patients and facilitate client referrals and access to available legal services, such as forms posted online that anyone can download and complete. Halkett views helping students like Yoshikawa hone their interviewing skills as particularly important. “Sometimes you have to probe your client’s story to get the facts that are relevant to their problem,” he said. After Halkett joined the team, Halkett and Sachs organized a training session to teach the nine volunteers participating in the Medical/Legal Partnership how to approach a broad range of issues they might uncover in interviews with clinic patients, such as landlord/tenant disputes, domestic violence, divorce, medical bills, powers of attorneys and wills. Halkett meets student volunteers at the clinic, which serves patients on Saturday afternoons when Vanderbilt classes are in session. 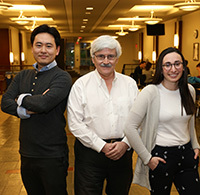 Under his supervision, law students have helped clinic patients with issues involving Social Security benefits and guided a man whose license had been revoked decades ago through the process of regaining his driving privileges. The Shade Tree Clinic is staffed and run by students at Vanderbilt Medical School and provides free health screenings and other health care services, including neurology and psychiatric screenings, to uninsured patients throughout the academic year.